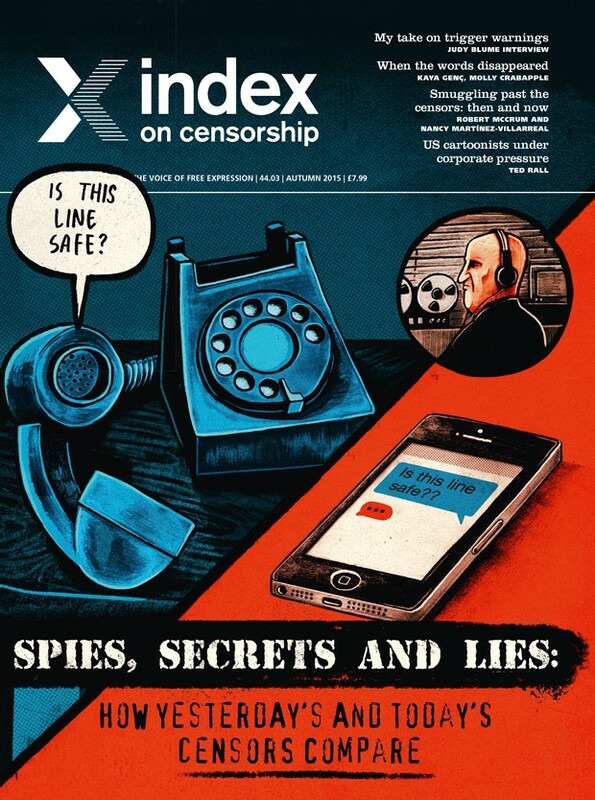 The autumn 2015 issue of Index on Censorship magazine focuses on comparisons between yesterday’s and today’s censors and will be available from 14 September. In the latest issue on Index on Censorship magazine Spies, secrets and lies: How yesterday’s and today’s censors compare, we look at nations around the world, from South Korea to Argentina, and discuss if the worst excesses of censorship have passed or whether new techniques and technology make it even more difficult for the public to attain information. Smuggling documents and writing out of restricted countries has helped get the news out, and into Index on Censorship magazine over the years. In this issue, you can hear three stories of how writing and ideas were smuggled into or out of countries. Robert McCrum swapped bananas for smuggled documents in Communist Czechoslovakia; Nancy Martínez-Villarreal used lipstick containers to hide notes in Pinochet’s Chile and Kim Joon Young tells of how flash drives hidden in car tyres take information into North Korea. Also in this issue, an interview with Judy Blume on over-protective parents’ stopping children from reading, Molly Crapabble illustrates a new short story from Turkish novelist Kaya Genç, Jamie Bartlett on crypto wars and Iranian satirist Hadi Khorsandi on how writers are muzzled and threatened in Iran. Don’t miss Mark Frary mythbusting the technological tricks that can and can’t protect your privacy from corporations and censors. There’s also a cartoon strip by award-winning artist Martin Rowson, newly translated Russian poetry and a long extract of a Brazilian play that has never before been translated into English. Spies, secrets and lies: How yesterdays and today’s censors compare? Take out a digital annual magazine subscription (4 issues) from anywhere in the world, £18. Have four stunning print copies delivered to your doorstep (US and UK), £32.